No doubt this is a matter that you should worry about. But there is a complete process for checking registered Sims under your iqama to minimize your confusion regarding the identity theft. Mobile phone Sims are commonly used in the increased terrorism activities all around the world. If there is an unidentified sim registered under your Iqama and you have no idea about it and it’s been used for some terrorism activity than you definitely are in trouble while living in KSA which applies strict rules for those who are living with iqama in the country. Related: Procedure of Iqama for newborn baby in Saudi Arabia! Related: How to book birth certificate appointment at MOI website? No doubt this is a matter that you should worry about. But there is a complete process for checking registered Sims under your iqama to minimize your confusion regarding the identity theft. You can easily inquire regarding the unknown Sims registered under your iqama number in the Kingdom of Saudi Arabia by any individual living here while using the services of any company. Related: International balance transfer from Saudi Arabia? Related: How to check remaining balance of Mobily Zain and STC? Go to write message option and write 9988 and send it to 900. Send a blank SMS to 616166. Send a blank SMS to 700123. Go to write message option and write ID and send it to 1755. Send a blank SMS to 309985. Finally, a service is launched in Saudi Arabia with the name of the communications and information technology commission that is responsible for assisting the expats and permanent residents to check how many Sims are registered under their iqama or identity number. This service tells about the mobile phone, internet connections and phone numbers registered under a person’s iqama. Related: Mobily Short codes and commands! This positive initiative by the KSA government has helped the residents as they can know about the registered Sims under your iqama. The procedure for checking the number of registered Sims under your iqama is easy at the site of CITC. 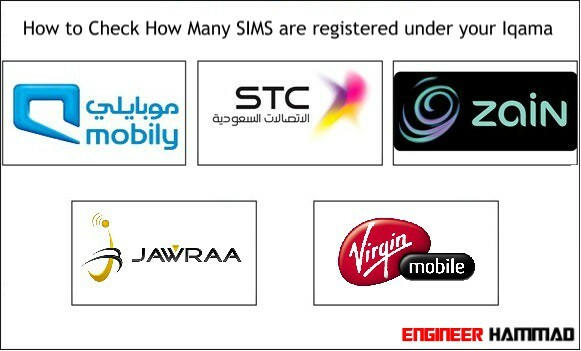 CITC gets all the numbers registered at any telecom service provider of Saudi Arabia. At the communication and information technology commission site you can check the number of registered Sims under your iqama registered with the communication service providing company. Click on this link to open CITC website. Here at this site you can skip entering your mobile number if you are not currently using any phone number and you can check the registered Sims under your iqama just by entering the iqama number you hold. But this will only show you the service providers registered under your iqama number, in order to show the mobile numbers you have to verify a phone number. You should check carefully and time to time that there are no registered Sims under your name that you are unaware of. Make sure in case you find that there are anonymously registered Sims under your iqama that you don’t know off you immediately submit complaint against such an act. Read More: How to change profession on Iqama? Read More: How to check the status of changed Iqama profession? Read More: How to check iqama transfer or change of sponsorship? Read More: How to check huroob status of Iqama on MOI or MOL?